FeastHome – Painting your kitchen is one of the most important transformations for your kitchen.With a lot of options and varieties, you have an ocean of choices. 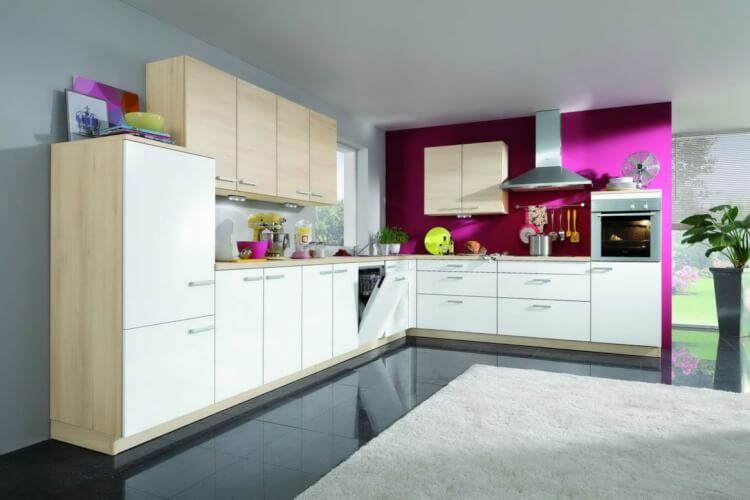 We have listed below all the colour choices that are great for your kitchen. Choose wisely. White and grey have always been the go-to colours to paint your kitchen with. Not only do they enrich the colour of the kitchen, the number of appliances and accessories that are compatible with this colour are uncountable. White goes really well with any single colour. In fact, for a lot of designs, white is the underlying colour. Pale red, turquoise and black go really well with white. Any colour on the grayscale goes good with grey. Bright colours like red, lime green and violet also go well with grey. Hues of blue are currently in trend. 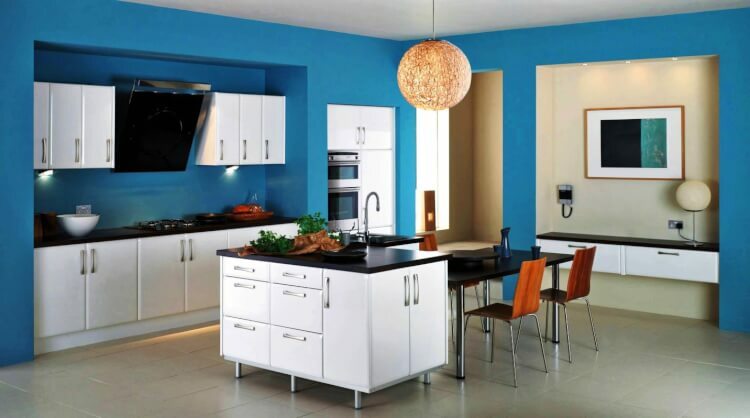 Be it Cobalt blue or teal, they add a different look to the kitchen. It’s a bold movement to use this colour shade. It is definitely a statement maker anda great choice. If you are looking for secondary colours that go well with blue, yellow is a great choice. You can paint accents of the cabinets and chairs in yellow. 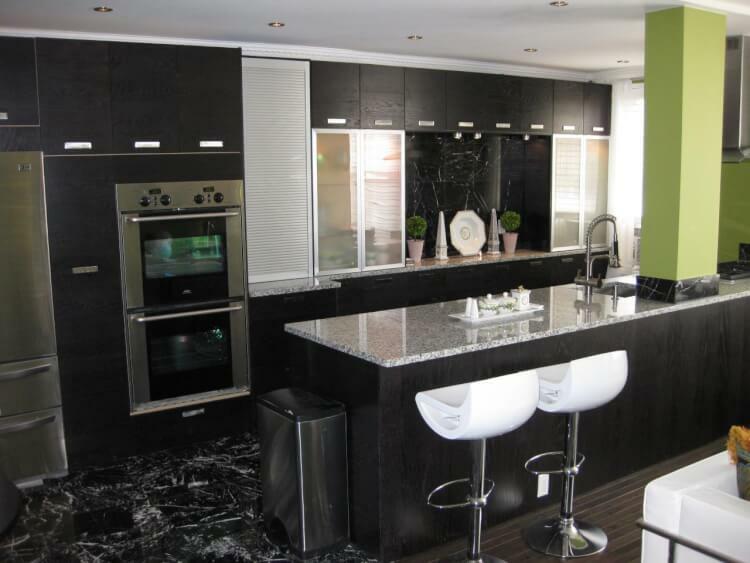 Black is surprisingly a good choice for kitchens. It’s a veryuncommon choice, but some people have mastered it. You do need a lot of lighting to support the colour, or you can’t see anything in the kitchen. If you think you’re using the colour too much, add a white countertop, it will neutralise the black. If I say light colour, the colours that come to mind immediately are white and grey. This is because you have so many accessories that you can use with these colours. 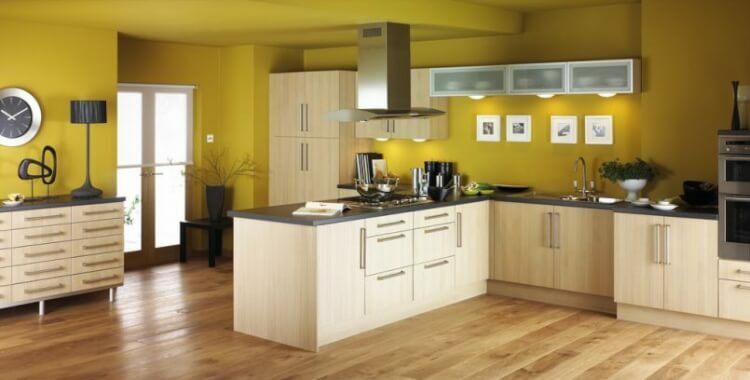 If you want to make a different choice, there are so many other light colours that add a new feel to the kitchen. Light shades of pink, gold and brown are some of the choices. These provide a bright ambience while also having a different shade than most kitchens. One thing that is as important as planning the colour is painting itself. It is a big process. You cannot just choose a colour, paint your cabinets and get done with them. It’s a process that you have to do with dedication. If you are getting a contractor, it’s fine. If you are doing it yourself, we are here to guide. Before you start painting, plan how you are going to make your food for three weeks from now. Clear all the items in the kitchen. Understand the types of materials that you are going to paint on. Metal and wood are easier to paint on than plastic laminates. These laminates also require special painting techniques and methods. Remove handles, doorknobs and anything else that you don’t need to paint. Get a set of small plastic bags and store hinges, screws and all kinds of stuff in them and label them. This way, you will not have any problem restoring them. Certain hinges only work in certain places. Make sure you label them correctly. Clean your kitchen thoroughly before starting any paintwork. This is recommended because there may be oil stains or dirt that you don’t see, but they will be exposed with paint and will look uneven and ugly. You don’t want bad paintwork in your kitchen. Use a solution and do it professionally. I can’t stress this enough. Take enough time with this process. Begin by painting on easier parts. It’s easier to paint doors first than struggling with highly detailed parts of cabinets. Use primer on the kitchen parts. Primer helps glossy paint look solid and stick well on surfaces. Some parts require more paint and more coatings. Make sure to spread the paint evenly.The look of your kitchen lies on how much time you spend carefully painting it. Once you are done with the paintwork, let it dry. Parts with more coatings might take longer to dry. Give it time. If you have completed painting your kitchen, it’s time to add the accents. Let’s take gold for an example. It’s a great colour, but finding products with gold accent is finding a needle in a haystack. Take the alternative route. You can buy gold spray canisters and spray paint your accessories. If you have small stools that you want in gold colour, this spray paint method will be easier to implement than the traditional paint brush method. Cover any areas that you don’t want covered, like the cushion, with paper and start painting. Painting your kitchen is a long process, but the outcome will definitely impress you. Take your time in doing it. Enjoy every moment, it is just as exciting as any great thing in the world. Follow our tips and get yourself a great kitchen.